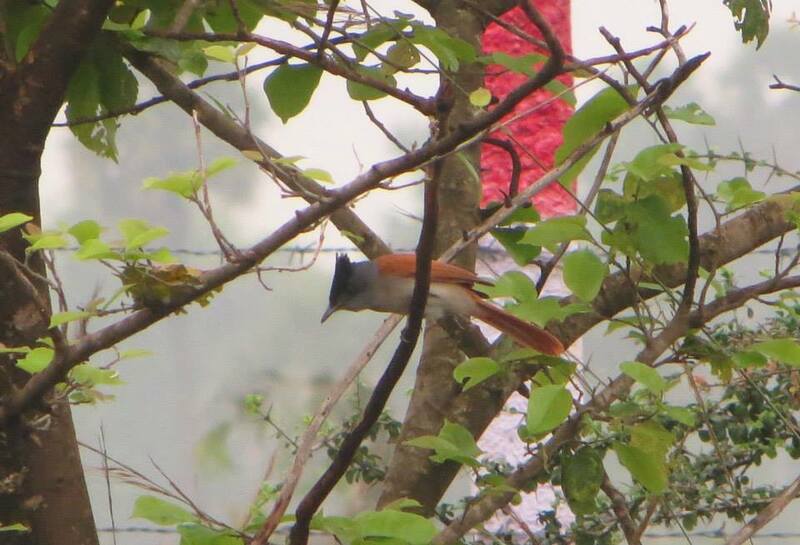 I have obsessed over spotting the Asian Paradise Flycatcher for years. She is one of those birds who looks as extravagant as her name might suggest. That’s not the case with let’s say the Streaked Fantail Warbler. Her name may suggest that she looks like Captain Planet’s arch-nemesis. In reality – she resembles a house sparrow wearing a shawl, just having a bad hair day. The Asian Paradise Flycatcher looks like an Asian Paradise Flycatcher. She sounds like one too. Two summers ago, a year after I had started birding, I was with a friend of mine near Ponneri town (on the way to Pulicat Lake). We were off to a good start, having spotted a White-Eyed Buzzard at first light. The sun came out early that day though, forcing us to soon seek shelter. As we were trying to find shade, we saw a damsel fluttering past a palm tree, in a bright orange uniform. She had a glossy crested head and a black-and-rufous plumage. Either we had seen the Asian Paradise Flycatcher or it was drizzling orange daylilies and we had caught the friskiest drop. But it was a little anticlimactic. Although beauty is subjective, it can be agreed upon that in the animal kingdom – males look more attractive than the females. Hence every time I had imagined being in close proximity to this shy passerine bird, I pictured the male, with his long tail feathers dipped in ivory and silk; his velveteen crown. Still, we giggled like school children when we recognized the bird as a gorgeous juvenile female. In our eagerness, we followed her every time she flew further away from us. Eventually, we either annoyed or scared her to the point that she never came back. My friend felt more bummed out than I did. Only a week prior he had shared a connection with a Pied Kingfisher. And he felt as though he had ruined it by disturbing this beauty’s morning rituals. A few months later, I spotted a female again at the Vedanthangal Bird Sanctuary. And then another while inside the Theosophical Society premises in Chennai. It has been almost a year since the last time. And I have revisited these places at least a hundred times. I am yet to spot the male. I am sorry, my beautiful orange juice box with wings, please tell the men in your extended family to forgive me too. I had written this post many months ago. 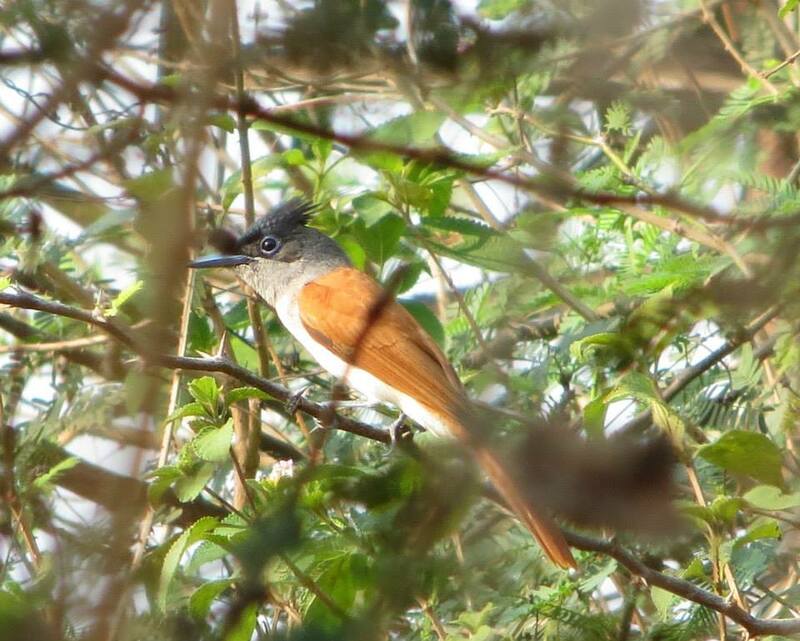 And since then, my love affair with the Asian Paradise Flycatcher has grown and continues to move me in ways I cannot fully understand. You can read about it below. I like this, it’s beautiful, I find it amusing…they are birds! aww birds are butterflies are we! je pense que vous ma donne un mal a la tete avec your jumping!!!!!!!! that’s all of the French I remember….I could add…a café au lait to it!!! i’ve run out of the frenchs too. system reboot! but spouts in foreign tongues we has to indeed. i also want to cluck alphabets. can we cluck alphabets, daffy? aye aye kapitane!!! daffy is rummaging deep!!!! 🙂 🙂 comes across cherry pink!! that wont do!!! Woohoo cherry blossom ladies of the forest! Have plentys of fun Daffy, Bring back photographs and leaves. Awww thanks meera, yes I take the photos posted on this blog. I had a 6 month elective on photography in journalism college in which we are taught to photograph people and purposefully arranged inanimate objects. But i forgot all about it. A year ago I was using an iPhone to shoot too. Even now it’s just a nikon coolpix which is fancy talk for wannabe camera. But i don’t want to be a photographer and watermark my stuff. Just birding, moss-staring and fruit-eating please. Click away comrade! Hehe I took print media as well. I hope you didn’t study in “that place” too. Wildlife photography nah that’s a pipe dream for me now, perhaps someday! I would so enjoy birding with you. Our obsessions are equal. Verminous Skumm? Orange juice boxes? Your imagery is unmatched in the birding blog world! Cheers, Christy. I am in a bus, on my way back from the hills and I doubt if I grinned wider while there than I did just now. Thank you heaps and loads, Shannon. I find your birding and passion for conservation unbridled, pure and unmatched. Did I tell you how much I missed your updates? I ve set aside time tomorrow for just that. Tea check. Oatmeal biscuits check. Shannon and greater family check! It wasn’t unfortunately that sort of trip, did have the honour of getting a bright young fellow interested in nature and photography and the utterly deliciously delight of spotting a Scarlet Minivet (i shall post soon, real angel this one) so yeah goodie good good! Ooo! Just looked him up. Your minivet is an American Redstart who might have gotten a bit carried away with the red body paint. What a delicious bird indeed. Looking forward to seeing him at VerseHerder. 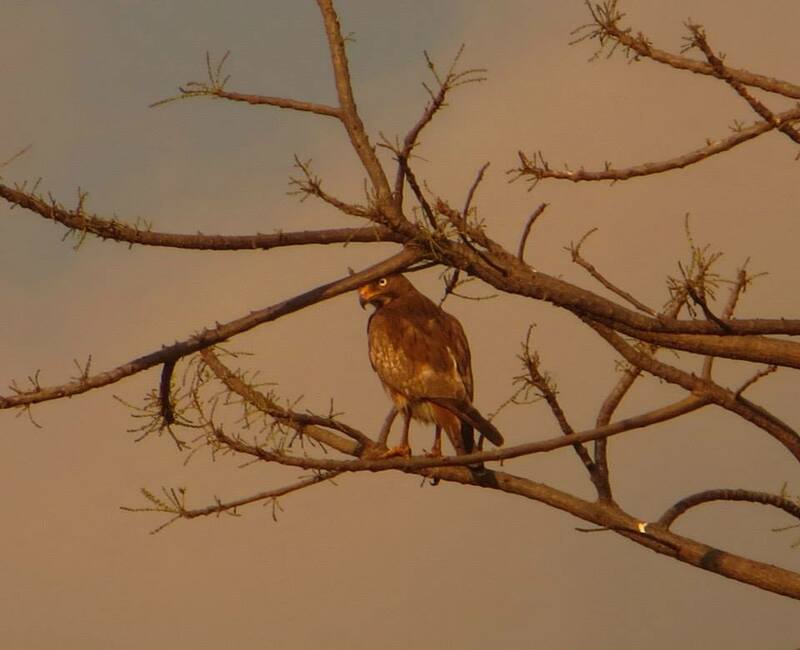 Nice pics – and congrats on finding one of your long sought bird! Aww shucks man you are too kind!